What I Crave I Cook | Discussions and Recipes of Deliciousness! Discussions and Recipes of Deliciousness! 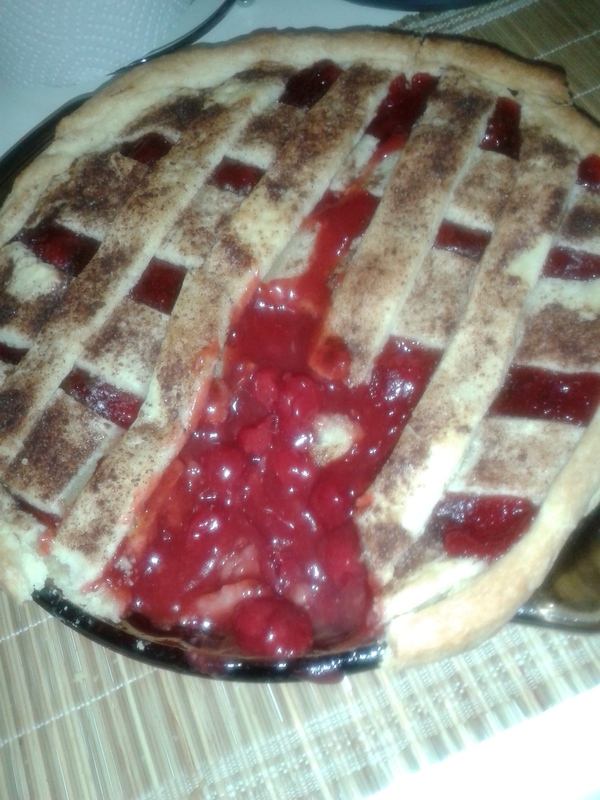 with her Fabulous Peach Cobbler recipe but since the majority ruled we swapped out the peach for cherry. Enjoy this recipe once a year if you are trying to cut back because it will knock you off your feet, into a chair…until you finish the whole pie. 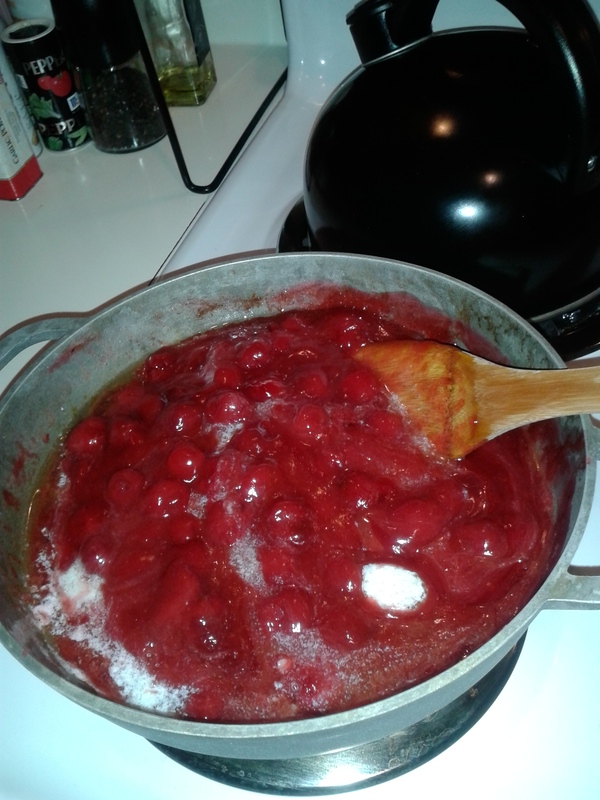 When you are scrolling down the recipe, please mind that you will see Cherry NOT Peach photos… Lets Grub! In a bowl add flour, sugar & salt. Give it a whisk to combine. Gather dough into a ball and flatten. Cover with plastic wrap and refrigerate for 15-30 minutes or until cold. Time to make the peach filling! Pour 1 can of undrained peaches into a saucepan. Drain the other can and pour the peaches in. We only need one can of juice. Add in butter, lemon juice, cinnamon, nutmeg and sugar. Stir over medium low heat just until sugar it dissolved and the liquid is syrupy. Set aside. Divide the chilled pie crust into 2 balls. One for the bottom crust and one for the top crust. 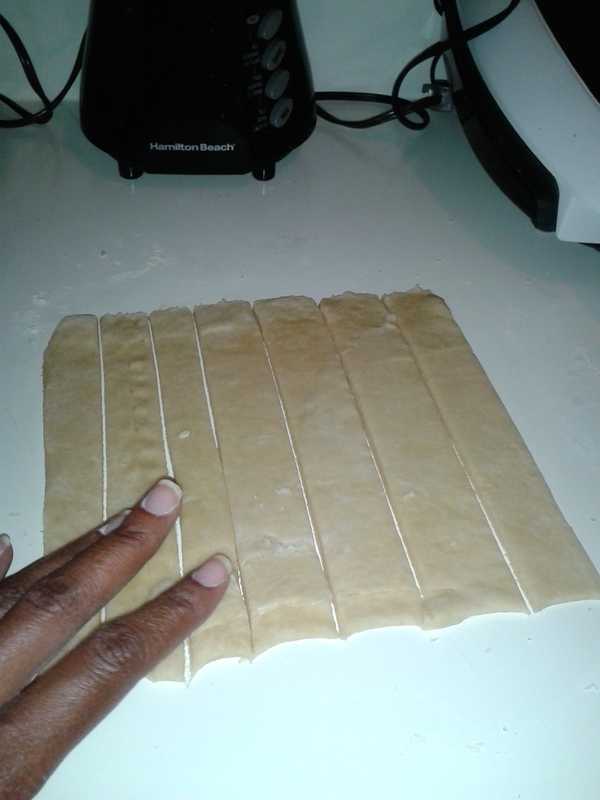 make the bottom crust, roll out a ball on a flour surface until it is about ⅛ inch thick. 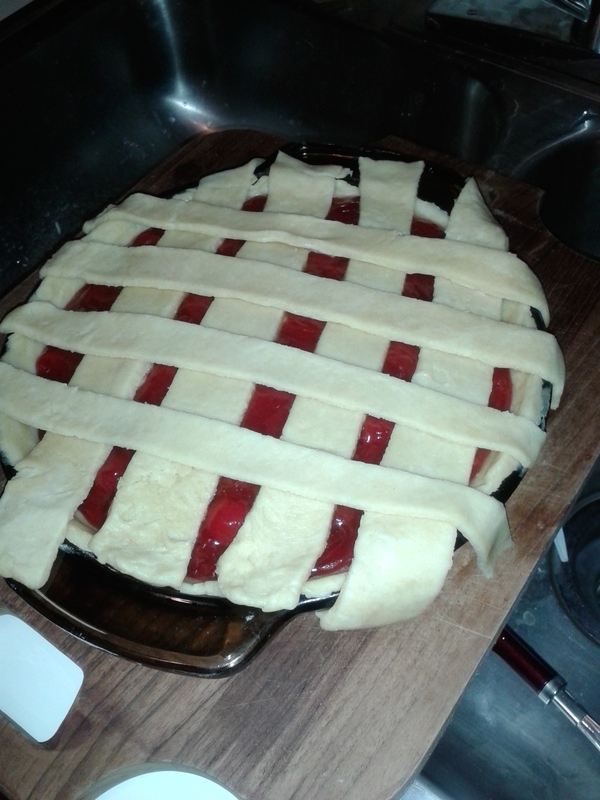 Place it inside of a deep dish pie pan. Sprinkle on some sugar mixture if desired and press it into the crust.Step 3.) Spoon on the peaches. Pour on a little juice to your liking. ½ cup will do just fine for me. 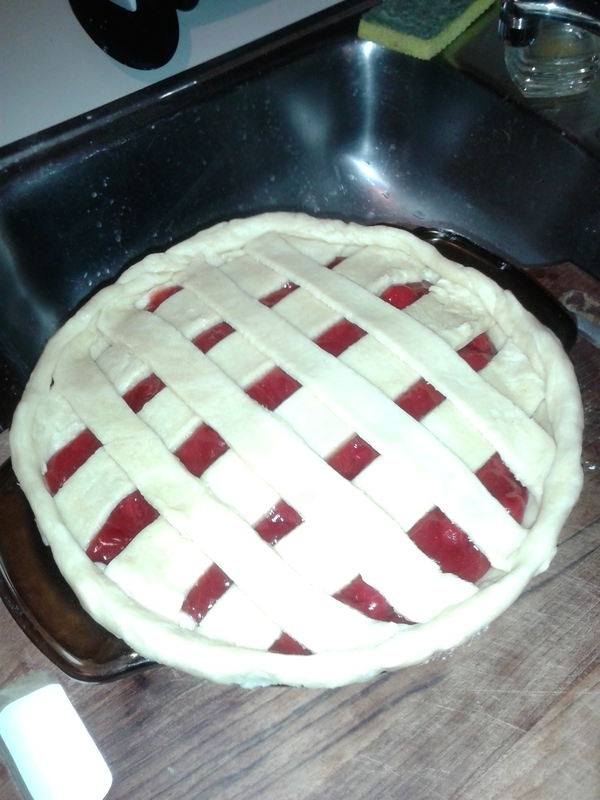 Now it’s time to make the lattice top crust.Roll out the other ball of dough so that it is long enough to make strips that will reach from one end of the pie pan to the other. Cut out about 8-10 1-inch strips. 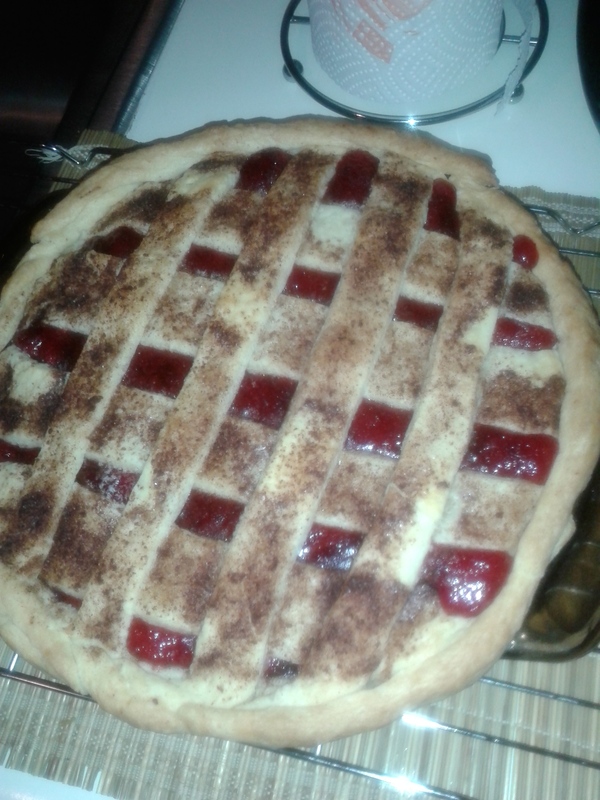 Drop a few pieces of butter on the pie and sprinkle with the cinnamon sugar mixture. Hey Foodies! It’s been a long time since I posted but I’m back with another shade-free blog. 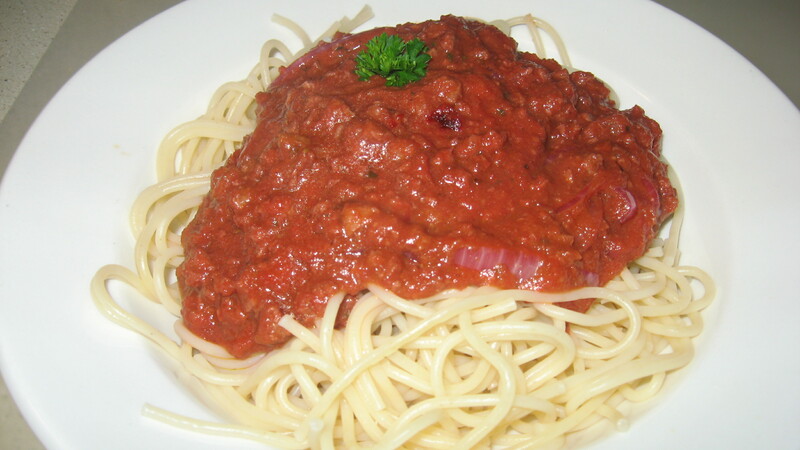 We all love spaghetti and for those Vegans out there…this is a great recipe for you too! I was experimenting with my new sauce and adding a few ingrediants along with the No Tomatoes Holy Marinara recipe. I will be back with more shade-free recipes but in the meantime it’s good to be back! Thank you for reading my foodie blog! ————————- heat olive oil in a medium fry pan, add onions and cook for 10 mins on medium low (this will get them extra soft and even more sweet). Add garlic. Cook for another 5 mins. Stirring occasionally. Add meatless crumbles. Cook just to heat then add sauce. Add seasoning. Feel free to add parsley or top your heated sauce with it. Either way is fabulous! Finally top with some cheese! Lets Grub! —-Preheat oven at 425 then in a heated pan over medium heat, add 2 Olive Oil. Sautee garlic and red bell pepper. Once fragrant add in meatless crumbles and spinach then cook for a few minutes. No more the 3 minutes the meatless crumbles do not need to cook that long so once the spinach wilt down you should be good. Pour sautéed ingredients in a bowl and add sauce then mix (add more if desired but be warned the more sauce you add the higher the risk you get of soggy dough when using biscuit mix, pizza dough is stronger and can hold more liquid for some reason). Sprinkle some flour on the place you choose to roll your stromboli. I took my biscuits out of the can and mashed them together into a ball then rolled and patted it out. It was about 4 inches wide and 3 inches long. If you have never worked in a pizza parlor like me then this will be a challenge but be patient and command the dough to work for you! On the edge closest to you add the mozzarella and top with sautéed mix (with added sauce). Now all you have to do is tuck and roll. 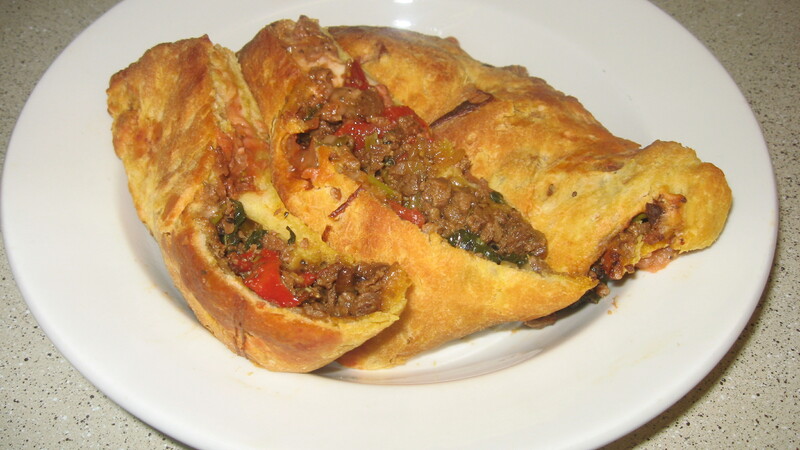 Once you are all rolled up, make a few cuts in the top of your stromboli to prevent the bubble effect. Bake for 25 minutes but keep an eye out for golden brown. Lets Grub! Hey Butterflies! See the pic? O yes! Ball storage containers got a free plug here! 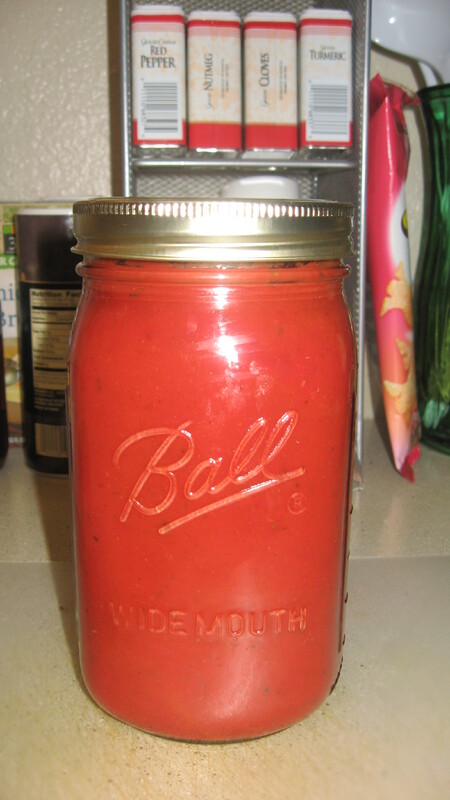 We are balling without tomatoes with this recipe I found for a great red sauce. You can use this for ANYTHING! My next posts following this will show you how but first lets learn how to make this delicious combo! Whomever you may be, do not be turned off by this link title, Man this recipe to replace tomato sauce is PERFECT! After trying it a few times, I felt confident enough to post it and the posts that follows are going to Blow You Away! We are talking a mix of Carrots, Beets, Garlic and Onion..What? YES! And in my opinion try a red onion for more spice! Lets Grub! If you have an experience before my next post, comment and let me know how things worked out! 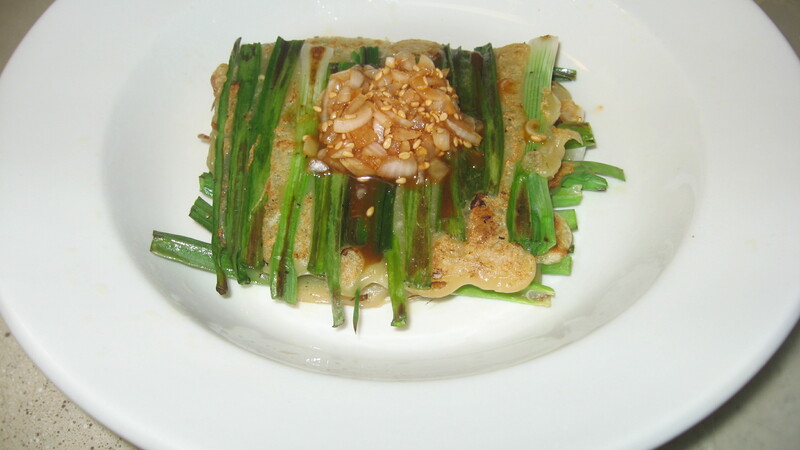 Green Onion Pancakes? A bit over the top! This recipe deserves it’s own post, I know I posted this before with a combo of Jamaican Shrimp but Cabbage Bhaji makes a great side and topping on many other things! Since trying this recipe I have had it in bread and with rice alone. It’s additive! You know one of these days I’m sure I’m going to run into a recipe that makes me cringe but until then I love the fact that each new recipe I try turns out to taste so Good! Lets Grub! 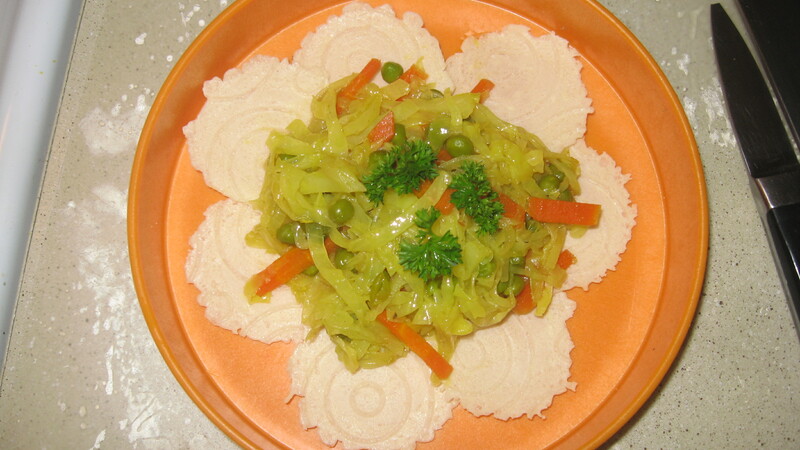 There are many benefits and treatments that cabbage is used for and of course the carrots are good for the eyes. Since I wear glasses I try to keep my prescription from getting any worse. New glasses are not cheap. I love my contacts more though 🙂 Check out some nutrition info on Health Food Nutrition a site I trust! Again here is the recipe on youtube! 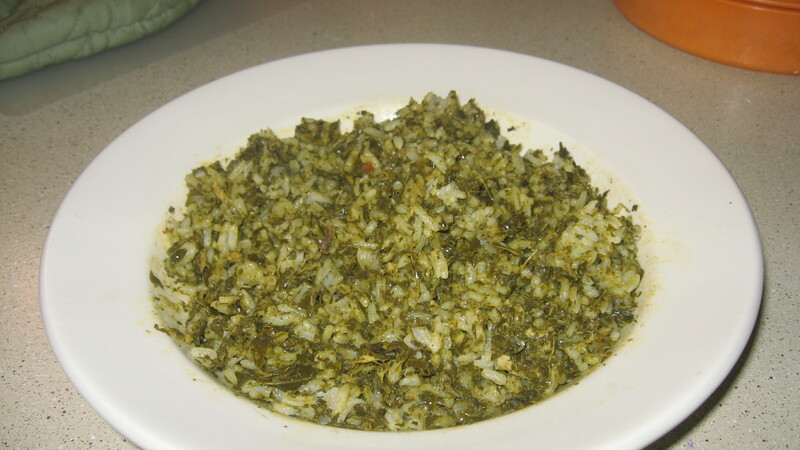 ———–In a large pot, add in Cassava Leaves on med/high heat, cover and cook for 10 mins mashing and stirring occasionally. Add bell pepper, onions, salt, 1 cup of water or just enough to get a boil at the bottom, cook for 25 minutes covered. Stir in palm oil, maggie, peanut butter, meat covered bring to a boil, cover, reduced heat to low and simmer for 30 minutes stirring occasionally. After 30 minutes give it a taste to see if any salt and water is needed then add cayenne. Best served over rice or eaten with Pounded Yam or Gari. Lets Grub! Got any delicious recipes to share? Email Me!